We use this as an alternative to baby wipes. We double up the paper towel and add a small amount of water. Doesn't have a smell like conventional paper towels. I took 1 star away as it is not the softest paper towel on the market. I love this paper towel. Good price and lasts a long time. I finally got a chance to try this paper towel and I have to say I wasn't impressed. It's a fair sized roll of white paper towels that are quite thin like that of a cheap paper napkin. Each full sheet is generous in size. I'm all for recycling things, but this is not my idea of a decent paper towel to work with. On the positive side...It's sturdy and doesn't separate during use, will drip once wet not like thicker towels. For light duty it's ok. Chemical/dye free always good. Would only buy again in a pinch. I purchased this to give it and try and am amazed. It is super absorbent and doesn't tear easily. I also love the fact that it has the half sheet tear marks. I would definitely suggest this to a friend. bought it to compare to bounty and other high end towels. work just as good as the others i have used. got more for my money will purchase again. Quality recycled paper towels - strong & absorbent, no toxic chemicals or dyes. The 1/2 sheets are great, perfect for use in the kitchen. 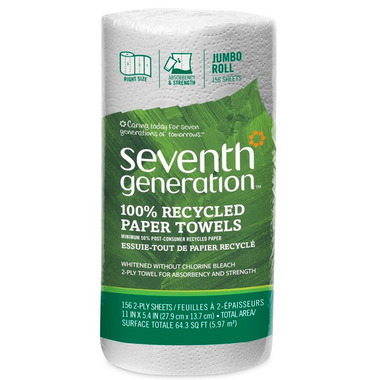 I use Seventh Generation's brown version these towels for cleaning purposes - also very good! Recycled paper and I love the 1/2 sheets. We will definitely buy these again! The best paper towel on the market. Environmentally responsible, absorbent, strong and now in 1/2 sheets!!! Way to go Seventh Generation.